Kim Schifino and Matt Johnson of Matt & Kim at Stubb's BBQ on Thursday, April 23. It’s the only thing you could hear from the sold-out crowd at Stubb’s BBQ last Thursday, just moments before the dynamic duo took the stage. They took their places and basked in the applause, teasing fans with one of their own t-shirts before tossing it into the sea of people. From the first bass drum hits to the beat of “Overexposed,” the crowd began to bounce up and down, both blinded and awed by the light spectacle. As soon as the first song ended, the stage transformed from concert to dance party, and the crowd needed no instruction to follow. “We are going to require a lot of participation from you guys,” Matt said, as he was met with unfaltering enthusiasm. The roar of the crowd was so deafening that Matt had to ask for the audience microphone to be turned down in his earpiece. He had to pause in the middle of his request to let the cheers die down, and he and Kim were left in absolute awe of the overwhelming enthusiasm. Matt returned to his keyboard, delivering powerful choruses while Kim beat her drums mercilessly, smiling from ear-to-ear. The band is currently on tour supporting their latest studio release, “New Glow.” With an arsenal of ten new songs, Matt and Kim dazzled the audience with their new sound while continuing to play fan favorites, and even a few vintage tracks that the crowd was both shocked and pleased to hear. Confetti and crowd surfers dotted the sweltering night sky. Kim tossed balloons into the crowd, while Matt instructed audience members to blow them up and throw them in the air at the drop of their next song. “Hoodie On,” a once highly criticized track, punched through the speakers as Matt counted down from three and hundreds of balloons took flight in the crowd, attendees singing along as if they had written the song themselves. 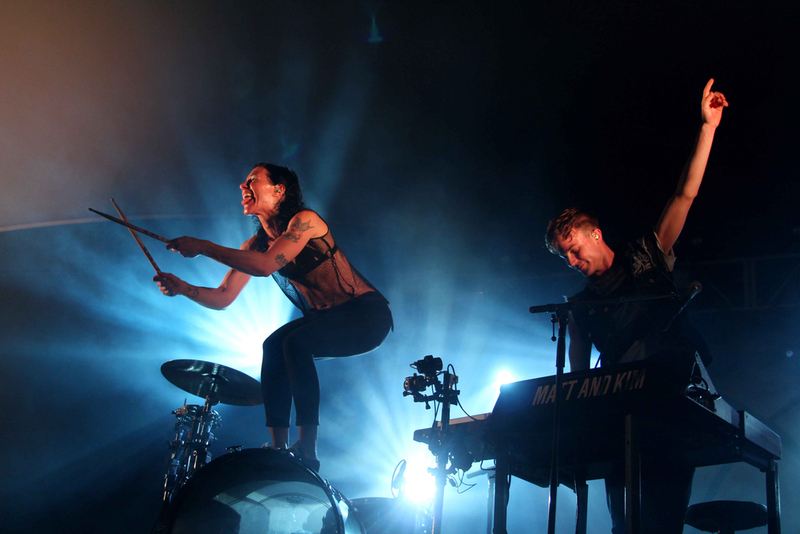 It was clear to the crowd that this show almost meant more to Matt and Kim than anybody else. After their encore, the duo hurled t-shirts, drumsticks and water into the audience, clinging to every last bit of energy radiating from their 2,000 crazed fans. But all good things must come to an end, and finally the sweat-drenched crowd dispersed, carrying the party off into the night with them.